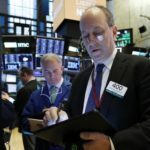 NEW YORK — U.S. stocks moved broadly higher in early trading Friday on Wall Street, putting the market on track for gains at the end of a shaky week. Banks led the gains after solid quarterly profit reports from JPMorgan Chase and Wells Fargo opened the latest round of highly anticipated company earnings. Banks have been benefiting from higher interest rates, which allows them to book fatter profits from making loans. Energy companies rallied after Chevron said it would pay $33 billion to buy rival Anadarko Petroleum. The sector has been rising as oil prices moved steadily higher throughout the year. Disney surged 12% to an all-time high after it announced plans to offer its own video streaming service. Disney will be going head-to-head with Netflix, which fell 3.7%. Fears over a global economic slowdown were put in check by a surge in China’s exports in March. That marks a turnaround from a severe contraction in February as the U.S. and China continue negotiating a resolution to their costly trade war. Indexes in Europe and Asia rose broadly. Investors continue focusing on company earnings reports due over the next few weeks in hopes of gleaning clues about the trajectory of the U.S. economy. Citigroup, UnitedHealth Group and Johnson & Johnson are among the larger companies releasing results next week. KEEPING SCORE: The S&P 500 index rose 0.6 % as of 10 a.m. The Dow Jones Industrial Average rose 218 points, or 0.8% to 26,365, riding on gains from Disney, Goldman Sachs and JPMorgan Chase. The increase puts the index close to recovering its losses for the week. The Nasdaq composite rose 0.4 %. OIL! Anadarko Petroleum surged 32% as Chevron moved in with a $33 billion buyout that will give it a stronger position in the energy-rich Gulf of Mexico and Permian Basin region in Texas. Oil prices have surged nearly 40% so far this year, sending energy company revenues higher and giving them more funds for investment. Pioneer Natural Resources rose 9.8% and Devon Energy rose 5.7 %. Chevron was one of the few decliners in the sector. It shed 5.4%. MAKING BANK: JPMorgan Chase rose 4% and Wells Fargo rose 2.1% after reporting solid profits in the first quarter. They are the first major banks to release financial results. Both reports show that higher interest rates during the quarter drove increases in revenue. Those higher rates allow banks and financial companies to charge more for loans and credit cards. Bank of America rose 3.9% and Citigroup rose 3.2%. Disney Plus video is scheduled to roll out on November 12 at $6.99 per month. The service is well below the $13 monthly price tag for rival Netflix, whose stock fell 3.4%. Disney ended a lucrative licensing relationship with Netflix in order to create the streaming service. It faces challenges as it builds a service to compete with the entrenched streaming leaders, which also include HBO Go and Showtime.